Today's mission is to declutter your garage. I know this is not a 15 minute type of mission, but instead a 15 minutes at a time type of mission, which is why I've also got quite a few days blocked out in the calendar for you to get this project done. As always, the first step in the organization process of any space is to remove the clutter from it. The thing is, when you think about decluttering your garage, do you panic a bit from the sheer enormity of the project? If so, take a deep breath and read the instructions below, plus scroll down to also see the inspirational photos from readers who've already done this mission and sent in photos to show their results to get you ready to tackle this project. Once you read this article you'll know this project can be done, 15 minutes at a time, and without making a bigger mess in the process than necessary, if you follow the steps listed. Before you begin the process of decluttering though, make sure to be clear in your mind about how you want to use your garage once it is decluttered and organized. This will help you know what types of things should be removed from the space, what should be kept, how much room you've got for storage or other tasks (such as parking your car, having a workshop area, etc. ), and it will also make the process of making decisions a lot easier for you. Garages are often multi-use types of spaces, or at least they can be. Some of the major "zones" you might consider for your own garage (and which are discussed more in the challenge article listed above) include a car parking zone, workshop or work area, and a storage area. Once you know what you want to do with your, at some point in the future clutter free garage, read on below for the actual steps in the decluttering process. 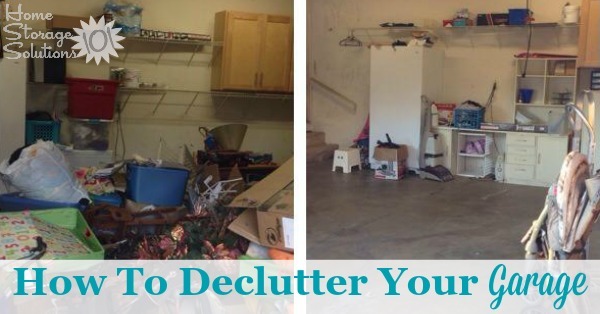 Along with feeling overwhelmed by the enormity of a decluttering project, which can cause you to procrastinate about getting it done, there is also the fear that you'll make a bigger mess in your garage if you start clearing clutter and make it worse. These are both legitimate concerns, but they can sure take the wind out of your sails when it comes to motivation. However, the steps I've listed below, when followed, can keep you from feeling as overwhelmed and make the mess created during the process much smaller, so it will actually take you less time to get it done. 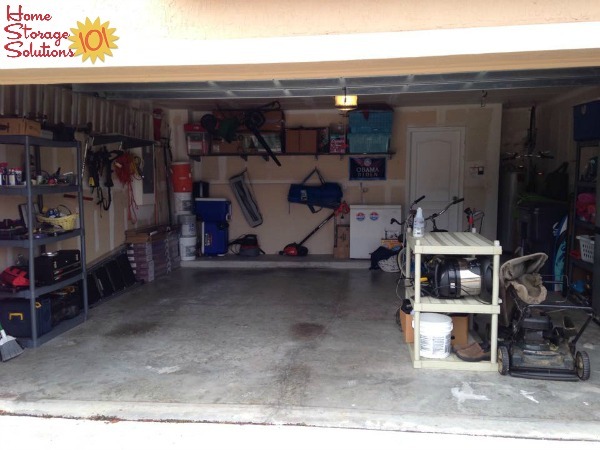 I get asked a lot, "where should I start the process of getting rid of garage clutter?" The answer is, surprisingly, anywhere you want, or even the first place that catches your eye. People get hung up on this question, but really you shouldn't. It is not where you start that is the important part. The important part is that once you do decide on a place to start you should systematically work on that area, from left to right, or top to bottom, without skipping past things to think about, or deal with later. The systematic part of this approach to decluttering is actually what makes the process less overwhelming, and also will keep you from making a huge mess. I've discussed this concept more in my article about how to declutter any area of your home. This article also discusses the 6 choices you have for every object you come across while decluttering, including choices like keeping it where it is, moving it to another room, donating it, selling it, etc. When you systematically deal with the box, items on the shelf, or piles on the floor in your garage, you will quickly get in the swing of making one of the 6 choices for each of the objects you come across. The systematic approach is one where you don't leave things with a decision unmade, with the thought that you'll come back to it later. Because it is those unmade decisions which lead to messes. To keep yourself from getting burned out as you work through the garage, which can be a very large space, set your timer for 15 minutes, and work for that amount of time on the project and then give yourself a break. If you only have 15 minutes total, only use 10 or so of the minutes to declutter and the 5 minutes at the end to clean up the staging area I'll discuss more below. If, on the other hand, you've got a block of an hour or two to devote to the project at one time, you should still break up your work into 15 minute sessions, but you can make sure to devote at least 30 minutes or so to clean up at the end to deal with the items you've decided to get rid of, so they don't become a mess. 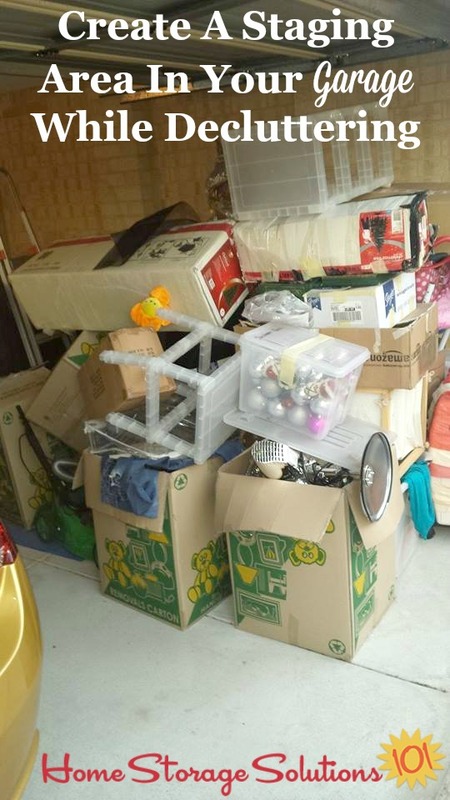 While the method I'm describing for decluttering your garage is one designed to keep the messes to a minimum, you cannot deny that, at least to a certain extent, decluttering can make a bigger mess during the process. After all, you need some space to spread out while sorting the items you come across, and then you'll need space to make your various piles, such as the donate, trash, and sell piles for clutter you're getting rid of. To make it as easy on yourself as possible create a staging area in your garage, or if it's a nice day, out on your driveway. This staging area should be empty, and free of clutter, and give you the free space to deal systematically with the items in your garage as suggested. For example, bring the one box you're focused on at that moment out to the staging area, deal with the entire box's contents, and put things into the appropriate piles in your staging area. With time, as you work through the clutter in your garage, your staging area will itself begin to feel crowded and cluttered. That is perfectly normal. You've moved all the clutter into this space. 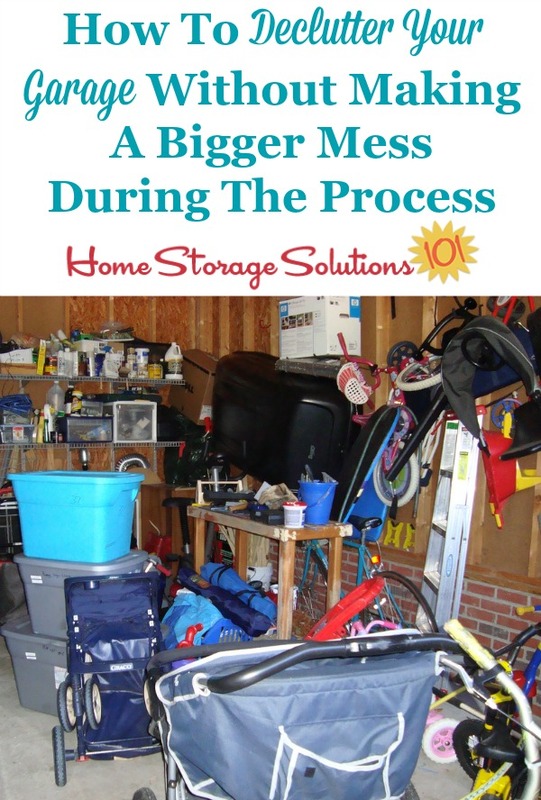 So the key is to stop the sorting and decluttering process anytime the staging area starts to feel to cramped and then deal with all the piles that have accumulated. This is when you'll put everything away that you've decided to keep, but put elsewhere in your home. It's also when you'll remove trash and throw it in the dumpster or trash can, and perhaps make a run or two to the consignment shop or charity shop for donations. Until you actually deal with the piles in your staging area you haven't actually decluttered, you've just moved the piles slightly. Decluttering involves getting all that stuff out of your home, completely, so cleaning up the staging area is where you actually do that. 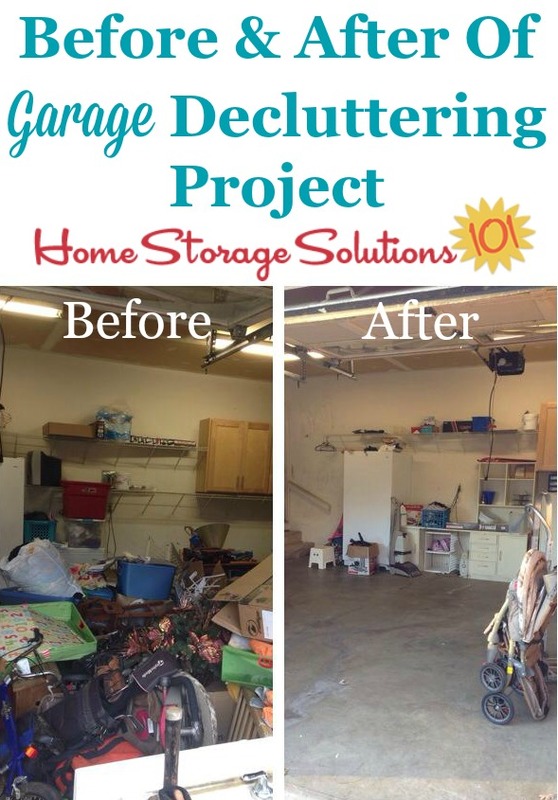 The photo to the left is from a reader, Ellie, who created a staging area for herself when decluttering her garage. In the photo you can tell she's already accomplished a lot, deciding all of these items should be decluttered. BUT now, as part of the process, she's actually got to move everything out of this pile and get it out of her home, by trashing, donating, and/or selling it. I know most of the things you've got to deal with in your garage are relatively small items, like things that can fit on a shelf or in a box or plastic container, at least in sheer number of items to make decisions about. However, the garage is also an area where you may have some big items that could also be considered clutter. Here are some common types of items you may find in your garage, some of which also have Declutter 365 missions of their own, and which may help you declutter these items further. These large items often take a bit more effort to get out of your home, since you often need to find a place that will take them, and/or transport them for disposal, and/or arrange for someone else to come pick them up for you. Ideally you could get rid of some of this stuff first, because it sure does clear up a lot of space in your garage quickly, making the process of creating a staging area much much easier. But, I know that these items are often shoved behind lots of other clutter, so again, just deal with these large items when you come to them, within reason. Obviously, if you've called someone out to pick up an old appliance go ahead and move around other stuff to deal with all of the old appliances at once, so you don't have to have someone come back out again in the future. After you go through the contents of your garage, systematically, and are left only with what you decided to keep in the garage on the first pass, I suggest you do the whole process one more time. This time it will go much much quicker, but often you find even more that you want to get rid of the second time. 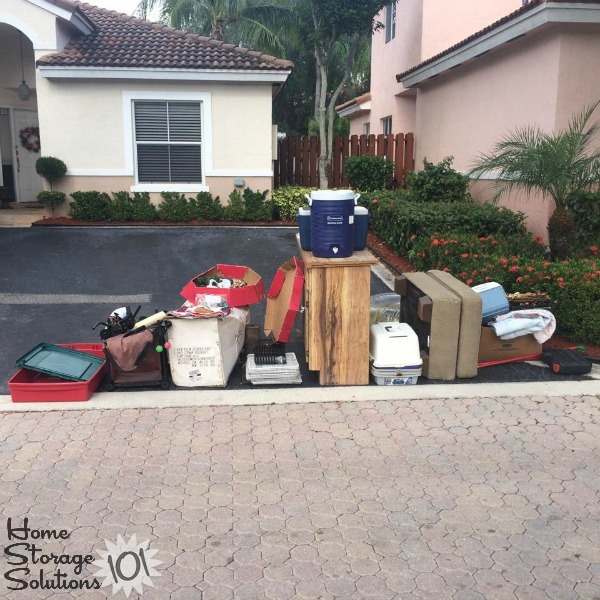 You do this repeat process in exactly the same way you did it the first time -- by adding things you want to get rid of into piles in your staging area, and then dealing with those items once the staging area gets full. Once you've done this process twice you'll now be left with only the things you want to keep in your garage, and it's time to stop decluttering, and begin organizing. That's the topic of the challenge article here, so take a look at it to finish this big project, and then feel proud of yourself for all you've accomplished! 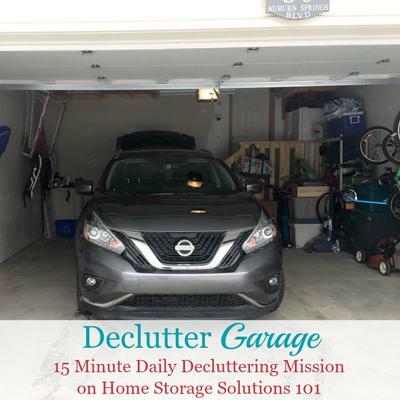 Below I've shown some pictures from readers who've already worked on this mission and decluttered their garages, to get you inspired and ready to tackle your own. Are you ready? Depending on how much clutter you've currently got in your garage this may be quite a huge project, but just look at the results you can accomplish when you put in the work! That's exactly what a reader, Jessica, did, and she sent in her before and after photos to show the huge difference. She said, "Our garage! 4 truckloads of trash and 4 trips to Goodwill." Awesome job Jessica, I'm so proud of what you accomplished, and I know you are too! Here are some additional photos sent in by readers, showing the results after they did this mission. The photo above is from Suzette, and along with her photo she described the revelation she had which helped her accomplish this task. She said, "I figured something out today that helped me a great deal, I hope it helps others too. I keep a lot of things, I realized, because I don't trust the Lord to provide for my future. Why keep an extra fridge in the garage? Because the one in the kitchen might break and I'll need a replacement. How silly of me. I also keep clothes in several sizes in case I gain or lose weight. So it dawned on me, He has promised to provide, if I am faithful. God says if I have two coats I should give one away. But what if I do that and my coat gets unusable somehow? God will provide another coat, fridge, clothes etc. In the meantime, I can trust his provision and be faithful to give my extra to someone who needs it now. So this morning I backed my car to the mouth of the garage and began to put many of my xtras in it. I filled the car with donation items, made several trips to the dumpster and began to organize what was left in the garage! And now, in my pj's with my feet up, I feel great and my garage looks super. Great feeling." 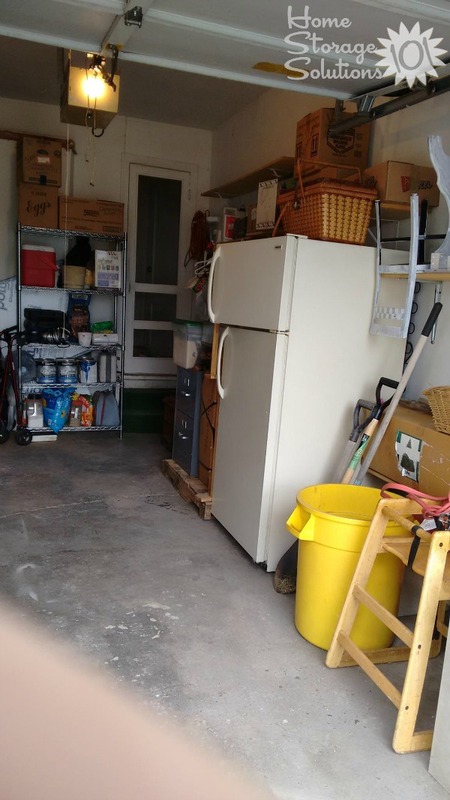 In addition, another reader, Heather, sent in the photo above of her decluttered garage. She said, "We just started your program and were so geared up that my aunt joined in the fun to help us do the entire garage today. Thanks for the inspiration!" 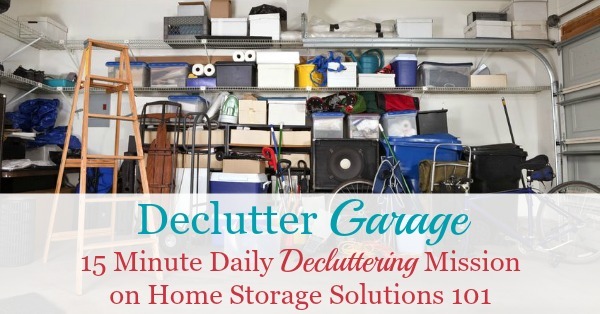 Are You Ready To Get Rid Of Your Garage Clutter? I hope these photos, and instructions, have gotten you inspired to get rid of your garage clutter. 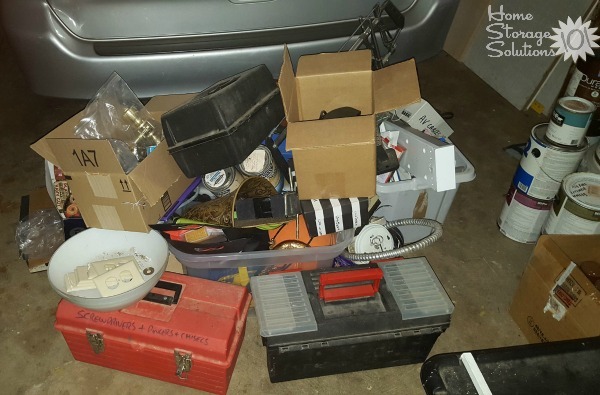 The photo above is from a reader, Rignach, who did this mission, and showed some of the stuff from her garage shop that she was getting rid of. In addition, here's another photo, this one from Beth, who also got rid of a bunch of stuff from her garage. She said, "Today we (partially) de cluttered our garage. This is our pile for bulk trash pickup. We also put out a curb alert on Craigslist, since not all of it is necessarily trash." Comments for Are You Ready To Get Rid Of Your Garage Clutter? We just did thus. We rented a dumpster and it was the best thing we ever did. With the help of my kids and their friends. We did it in one day!